NASS EL GHIWANE - mudd up! its been a few months, or more, since someone commented on one of my maghrebi music posts. that’s ok. I. WONT. STOP. from a 4 CD Fassiphone comp you can cop for 20€ in the right town. Allal Yaala (the man on the left above and below) is responsible for the banjo playing, which cuts straight to the heart. they are like this live – surefooted and unhurried – always opening spaces for Omar’s spoken words. when NeG hit their rhythm and all parts conjoin, the momentum, contagious. 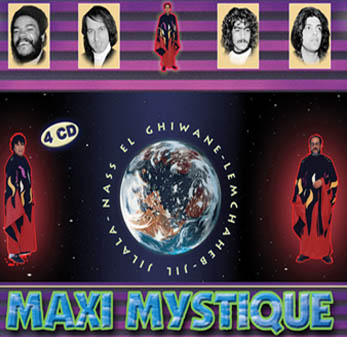 La Gazette du Maroc just published a fascinating interview with one of the major north African expat producers in Paris, Brahim Ounasser, centering around his work with Nass el Ghiwane. Qu’est-ce qui explique cette ruée vers la musique en ces années-là ? Les immigrés vivaient majoritairement dans la solitude. What explains this rush towards the music in these years? The immigrants lived mainly in loneliness. Thanks for the post. The instrument you’re referring to as ‘banjo’ is in fact not the Western instrument as we know it but a similar one from the Orient called ‘jumbus’, i.e. it is fretless but with a similar body like the Western banjo. Hey, I don’t comment your posts about maghrebi music, but I enjoy them! Actually I learnt more about this music with this blog than while living 25 years in France among immigrants from Maghreb. You surely know more about it than most arabic people I know! Allal calls what he plays a ‘banjo’… he uses steel strings & removed the frets way back in the 60s to be able to play quartertones. ive never heard of a jumbus… but then again, esp. in Morocco, certain instruments have many names (sometimes across languages, sometimes within the same language) and many permutations. thanks for the comments! Maghrebi sounds will keep coming. i hope to post more Algerian material over the coming months. As a banjo player – who lives, plays & (works?) around Africa & sometimes Dubai, Oman & even the Yemen – I highly dig you North African banjo gems. Like eluded to, I’m one of the new-school banjo Americanos to go in search of the banjo groove & roots in West Africa. Griots or not, call it xalam, ngoni, huddu, ekonting etc… on & on the list of instrument technology that became the 5-string banjo in the Americas…. Now me I’m not looking for the holy grail of banjo origin in Afrique but for a better thicker way to groove on my axe… That can be found All over Mamaland. I just wanted to say I really dig your work & keep laying it down – cause I’m getting it. talk about cover art. that first album cover is incredible. yes, i was waiting for someone to say that… maybe this month at mudd up should feature only those albums whose covers involve OUTER SPACE. & thanks, Ephraim, for the banjo breakdown. Am-Brit minstrelsy in SA! your maghrebi posts are truly appreciated. thanks for the continued maghrebi posts, jace. the albums covers and music are very exciting and your words enlightening. thanks also for the breakdown re the banjo. it seems almost every country in africa from ethiopia (one of the the probable origins) to senegal has a banjo-related/-like instrument. my favorite is the kolgo from northern ghana, which a guy named king ayisoba has incorporated into modern pop music (http://www.myspace.com/kingayisoba). i am heavy into these tracks (and album art – big up kingdommm). i am deeply curious about the lyrics of these songs. what are they singing / talking about? More maghrebi please, learning is the best policy. I usually don’t comment on these posts because I’m mad ignorant and have so little to add besides something like ‘great!’ This does not however mean that these posts are not being read, listened to, digested and enjoyed. Comments are not the sole index of good blog posts. Just floating through again. That first album cover isn’t probably even traceable–it’s most likely the freelance work of some unknown. 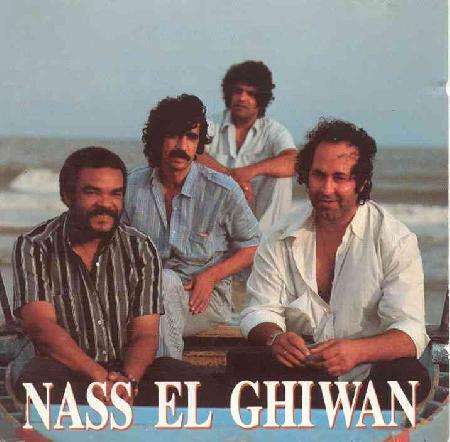 As you can see, the album contains some selection from the music of the three main “super groups” that came out of the seventies and early eighties: Nass al-Ghiwan, Jil Jilala (which shared some members with NaG), and Lemchahib.